You hear it in the grocery store, the doctor’s office, in line at restaurants, and see it on social media — the roads in eastern Kentucky are awful. One person complains of a busted tire, another of having to have his front-end alignment redone. On KY 588 near Kingdom Come Creek, an entire section of highway is caving in. On KY 1103, it already has caved in. That road is down to one lane in several places where asphalt — some of it brand new — has been replaced by gaping holes all the way to the creek banks below. There are cracks, breaks, bumps, potholes and humps of cold-patch asphalt every few hundred yards. 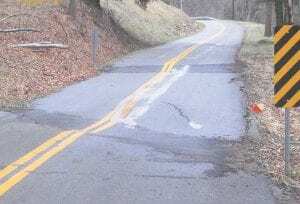 New asphalt on KY 160 has sunk nearly a foot, leaving the road looking like a giant took a bite out of the mountainside all the way to the double yellow line. On US 119 near Fishpond Lake, pothole patching last year left the road in worse condition than it was before. Steve Green, Kentucky Highway Department section engineer for Knott and Letcher counties, blamed much of the problem on weather. Green said the District 12 office has applied for money to drive steel and shore up some of the roads, including KY 3409 on Dunham Mountain and KY 588 at Kingdom Come, but the department’s budget is down because of the decline in coal taxes. “Something needs to be done in the legislature for more revenue,” he said. State budget documents show the total funds for the highway department are down $800 million since Fiscal Year 2016. This is Fiscal Year 2019. Total expenditures over the same time period are down more than $500 million, with most of the cuts in construction and personnel. 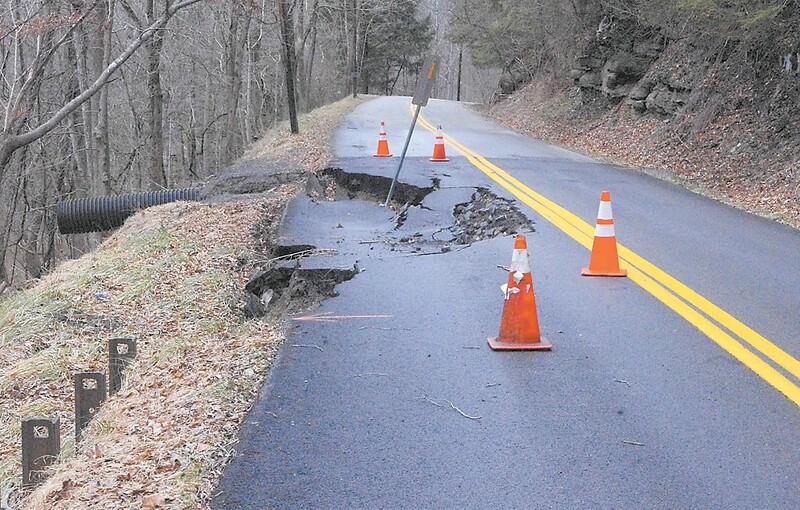 Letcher County Judge/ Executive Terry Adams said some people have mistaken the roads for county roads and called his office, but there’s little the county can do except pass the word along. She said the teeth-jarring bumps at each end of several bridges on that same road are the result of settling once the road was paved. She said they will be repaired in the spring when the asphalt factories reopen. The same goes for the section of US 119 near Fishpond Lake, and the widening of US 119 from Cougar Drive to the fourlane highway at Ermine.